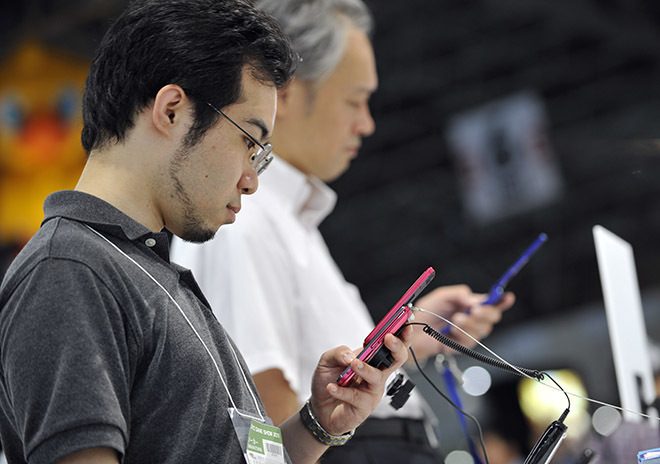 Gamer Yuji Watanabe tries out a smartphone game at the Tokyo Game Show on Thursday. CHIBA, Japan — Cellphones might be the smallest of gaming machines physically, but they’re making a big footprint at this week’s Tokyo Game Show. The annual exposition of the newest and greatest Japanese videogames, taking place Thursday through Sunday at the Makuhari Messe convention center outside Tokyo, has traditionally been the home of blockbuster games for PlayStation 3, Xbox 360 and other dedicated gaming consoles. The Final Fantasies and Monster Hunters that the country’s gamers love are still here, but with sales of traditional games in decline, the booths have been noticeably scaled down. Some major publishers, like Professor Layton maker Level-5, declined to even set up a stand this year. In their place, dominating a massive section in the center aisle of the show floor, are smartphones and tablets: iPhones, Android phones, PlayStation phones and all manner of Japan-only devices with keys that easily let the country’s millions of texters type out entire novels’ worth of kanji messages. Cellphone games have been part of the Tokyo Game Show for more than a decade, but until this year, the casual time-killers lurked on the periphery of the show, in the backs of the booths, attracting few onlookers. Smartphone games are front and center in 2011. And they’re foremost on the minds of Japan’s game creators. Speaking at a game preview event the company held Wednesday evening, Yamaoka said the mobile games market and the traditional game console market were roughly the same size in 2010, but that mobile games are officially bigger in Japan this year than console gaming. Grasshopper is known for creating games that appeal strongly to hard-core gamers –stylish and ultraviolent titles that take inspiration from Quentin Tarantino films and punk rock soundtracks. After talking up several such games at its evening event, Yamaoka said Grasshopper would partner with mobile gamemaker DeNA to break into the smartphone gaming biz. Mobile gamemaker Gree is the most notorious interloper here at Tokyo Game Show. The company never operated a booth here but now takes up as much space as neighboring Sony. Gree’s massive booth is a visible sign of how fast, and on how vast a scale, the gaming business is changing. One challenge for Gree and other mobile gamemakers: Creating mobile games that appeal to hard-core gamers as well as casual players. Gree President and CEO Yoshikazu Tanaka noted the dilemma. Tanaka said Gree’s games aren’t “cannibalizing” the traditional industry. He joins the chorus of those who say that simple mobile games have expanded the gaming audience by lowering the barriers to entry — smartphone games are cheap and easy to download. But if Grasshopper’s Yamaoka is right, then mobile games are also eating into the free time of gamers who already play on traditional consoles. Yuji Watanabe, a hard-core gamer who has played the Resident Evil series for the last 15 years, tried out the new mobile version of the zombie shooter at the Gree booth.